Heat rash, also known as prickly heat, is particularly common in babies as their sweat glands are not yet sophisticated enough to regulate temperature. It occurs when the body becomes overheated and sweat is unable to evaporate, block­ing the glands. Symptoms include small, itchy red spots spreading across the neck, face, shoulders, chest and in the creases of elbows, knees, armpits and nappy area. 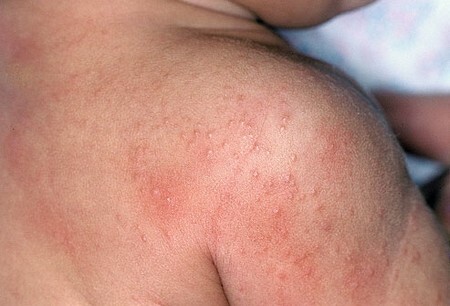 Once the child has cooled down, the rash should eventually disappear. Cool your baby in a tepid (not cold) bath or sponge down the skin. Dry them thoroughly, particularly in the folds of the skin. Make sure there is a circulation of air in the room and any heating is turned down. Put on only light cotton clothing. An aromatherapist may recommend a bath containing two drops of Roman Chamomile, a useful anti­inflammatory, one drop of Lavender, soothing for inflamed skin, and one drop of Sandalwood, for relaxing, which should help to calm the skin. For babies under a year, mixing together 54 cup of baking soda and two drops of Lavender, before adding to a tepid bath, has been effective. Herbal medicine Calendula ointment or lotion can help to soothe the rash, particularly if also mixed with a little Aloe Vera gel. Or a poultice of nettles soaked in a bowl of warm water and applied to the skin may be recommended. A cold compress using a couple of drops of Lavender, or a cold infu­sion of Marigold may also be beneficial. A homoeopath will look at how the child is reacting to the rash as well as discussing the symptoms and will give a remedy accordingly. For instance, if the child is also hot and feverish, Belladonna may be given. An acupuncturist would choose the energy points in the body that may help to eliminate the toxins caus­ing the rash, dispersing it and re-balancing the body. Using points to boost the immune system will help to prevent further outbreaks. If the symptoms have not disappeared after twelve hours con­sult a doctor in case there is another cause for the rash.